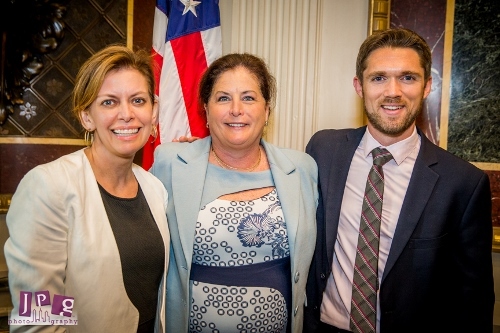 From left to right: Tracy Hoover, CEO, Points of Light; Diane Melley, Vice President, Global Citizenship Initiatives, IBM Corporation; and Josh Dickson Director, Center for Faith-based and Neighborhood Partnerships, US Department of Commerce at the White House “Pro Bono Service: Harnessing Time and Talent for Social Good” event. At the height of last year’s Ebola outbreak, the citizen engagement team at IBM Connections in Sierra Leone put their talents in technology to work, creating a way for citizens to report Ebola-related issues and concerns via text or voice calls. The people behind the project – which provided real-time insight to the government and helped health care companies more effectively deliver trial vaccines – were not only highly skilled IBM employees. They were volunteers. Yesterday at the White House, I participated in an event – convened by the White House, Points of Light and the U.S. Department of Commerce – that brought together corporate and nonprofit leaders for a change-making expo. We showcased some of the newest tools and innovations in pro bono service. With business titans like IBM, ConAgra Foods, Deloitte and HP sharing the stage with exponentially smaller companies in the Washington, D.C. area, such as Raffa and M Powered Strategies, there was ample evidence that pro bono service can be a powerful new weapon for tackling tough societal issues. And the solutions on display yesterday provided an exciting glimpse into the future of social innovation. It was easy to imagine a day in the not-too-distant future when socially and community-minded companies look first to their core business assets – those skills, systems, products and operations that give them a competitive business advantage – as their most powerful resource for change-making. In some ways, yesterday’s event was the continuation of an effort that started nearly four years ago, when Points of Light took on the management of the Billion + Change campaign, asking 500 companies to pledge $1 billion in skills-based and pro bono service. American businesses far surpassed that goal, with more than 2,500 companies pledging more than $2 billion in pro bono service. But as exciting as the numbers are, I found myself most excited about how this pro bono field is evolving to more precisely marry specific corporate assets and expertise with the community issues and nonprofit organizations where they can have the most impact. At its best, this new breed of business and nonprofit collaboration has real breakthrough potential. Just imagine the possibilities of deploying the same American business ingenuity that fuels the world’s leading economy to tackling the most critical issues of our time – such as eradicating extreme poverty, ensuring strong community health and education systems, protecting our natural resources. We’re already on the verge of this new kind of sharing in pro bono service – one that goes beyond one-time service delivery and focuses instead on developing tools and resources to help address the world’s biggest challenges. The most effective pro bono service is about thoughtful partnerships that match up the right talents, and that lead more directly to solutions. Our collective charge now is to take that partnership model to scale, with as many businesses and nonprofits sharing successes along the way. I’d love to know how your company or nonprofit is leveraging pro bono service for making change!